Pulled pork is dish where pork is cooked in low heat in long periods making the pork meat “pulled” apart or easily broken down into smaller pieces due to its tenderness. Traditionally it is slow cooked by smoking the meat but newer versions use oven and slow cooker method to make it more convenient preparing the said dish. In a pot heat oil and sauté garlic and onions. Remove everything from the pot and transfer it in a slow cooker, pour root beer and barbecue sauce then cook for 6 hours. Remove from slow cooker and place on a pot, then cook until liquid is in a very thick consistency or nearly dried. Use fork to loosen meat into threads. Serve with your favourite bread. Pulled pork can be served in numerous ways and the most popular one is a sandwich filling, other ways can be topped over rice or served on its own. This recipe will be really easy but you have to be patient as the best way to prepare it conveniently id the slow cooker method, so best to do it early in the morning (make sure someone is at home looking after it) so when you come home it’s all ready for you and your favourite bread. Root beer inside this dish Raymund, very creative I must say. With the sandwich is a good change then rice of course. Your pulled pork looks fantastic. I am not sure we even get root beer anymore – I will have to look out for it. Ah, this is practically a religion here in the south. Nice looking sandwich. 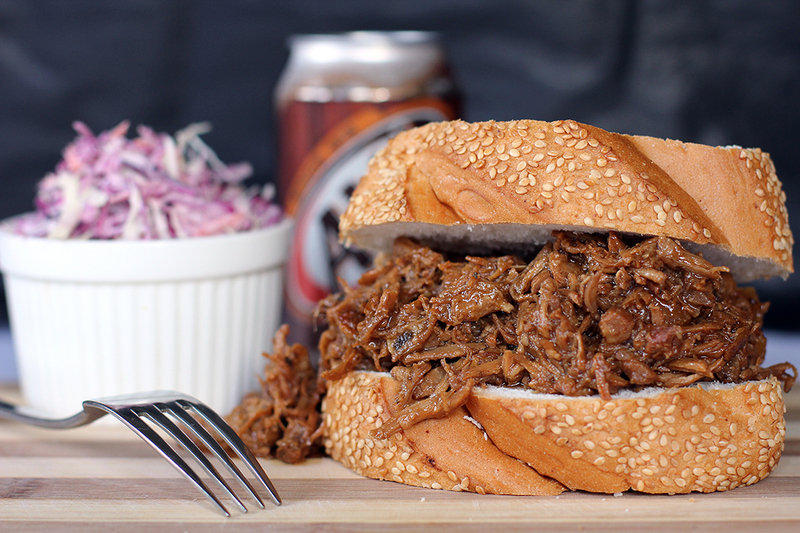 Few things are better than a pulled pork sandwich. Nice job! Your pulled pork is so juicy and moist!!! I’d love to have this as lunch or even dinner…. so delicious! I made pulled pork with beer before, but didn’t realize we can use root beer too! This is my boyfriends favorite type of sandwich- I’ll have to pass this on to him! with root beer? my my!! I thought only 7-up or sprite can be used as ingredients..
Sarap siguro nito palaman sa siopao? okaya sa pandesal…penge!!! I have never had a pulled pork sandwich, I think I have to repair this mistake! It’s that time of year again…time to bust out my slow cooker. This looks like the perfect recipe to start off the season!